A history of horror movies hosted by Anthony Perkins, and featuring clips from scores of horror and sci-fi classics. A precursor to "Terror in the Aisles"
Written by Time Magazine critic Richard Schickel and hosted by "Psycho" star Anthony Perkins, "The Horror Show: 60 Magical Years of Movie Monsters, Madmen and Other Creatures of the Night" is a documentary about the horror film genre which aired on CBS in February 1979 and attained theatrical distribution elsewhere in the world later in the year. Like the '80s feature "Terror in the Aisles," what's appealing about this is that it's one enormous clips show featuring a wealth of snippets from a vast array of popular horror movies. In an era just before home video made movie collecting accessible to the public, movie fans had to get their fix from TV specials like this one. While it delivers the goods in many respects, it's disappointing in others. Perkins was an inspired choice to host (he even appears on a mock porch of the Bates house while introducing a clip of "Psycho") and there are more memorable movie moments than they could probably get away with featuring today. Unfortunately, a lot of the clips are lengthy (the Dracula and Frankenstein sequences both seem to drag on forever) and tons of influential classics ("Carnival of Souls," "Night of the Living Dead," "Rosemary's Baby," "Carrie," "Halloween," etc.) were omitted. 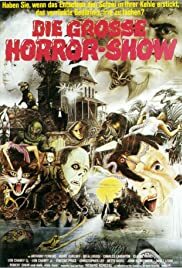 This was in the heyday of TV censorship, so there's no way that they could've featured some of the scarier/gorier clips, which might explain the omissions. Further detracting from the proceedings is some of Shickel's heavy-handed narration, which takes a psychological "this is why people are attracted to horror movies" sort of viewpoint, mostly omitting interesting information about the makings of the films - and numerous times throughout, Perkins spouts off misinformation about the years that films were released. For what it is and when it was made, the special is a tad above average - but in an era when we can click a button to get information about and watch clips from practically every popular film in existence in HD clarity, it's pretty outdated.